Designed with parenthood in mind. 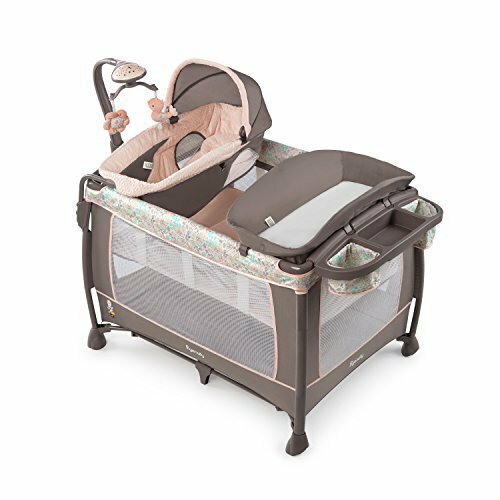 Soothe Me Softly Playard in Piper fashion will pamper your little princess in plush fabrics, plenty of options for soothing, and a play yard that's full of conveniences for mom. The DreamCentre is the perfect, cozy place for newborns to rest and nest. A unique mobile provides a soothing light show of stars and plush toys to lull baby peacefully to sleep. Moms love our One Less Step feature that allows you to fold faster by skipping a step - you don't have to remove the mattress. The washable pieces which include: dream center, mattress, and changing pad can be removed in minutes to go into your washing machine to keep baby's environment clean. The elevated changing table gives mom's back a break and an organizer tray keeps baby's needs close at hand.